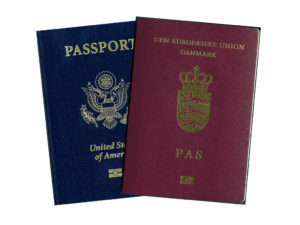 Danish Nationals living in the United States now enjoy the option of having dual citizenship. Danes who lost their Danish citizenship when they became citizens of another country prior to September 1, 2015, can apply to have their Danish citizenship reinstated. For more information about Citizenship [in Danish statsborgerskab og indfødsret] please see www.statsforvaltningen.dk and http://www.statsforvaltningen.dk/site.aspx?p=8903 .